You know how we feel about the importance of making education more entertaining. Games can be used to explain various educational principles so earlier this year we put together a list of games that can be used for teaching science, history, math, language and more. Companies have recognized the value in incorporating STEAM and STEM principals into games, toys and more. We found a variety of STEM items that we think deserve consideration as you are working on your holiday to-do list! 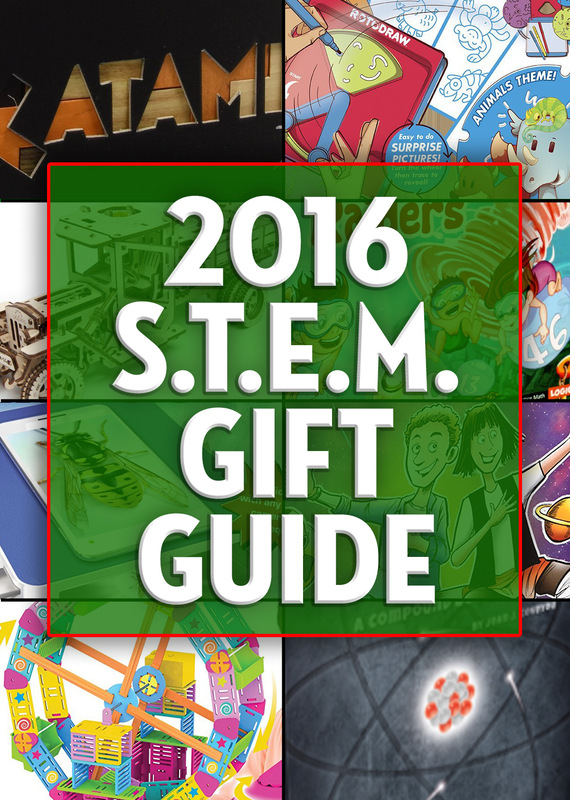 Between this STEM Gift Guide, our Stocking Stuffers Gift Guide, our guide with games for the family and dice games Gift Guide, you’re hopefully getting some good ideas for marking things off your list! 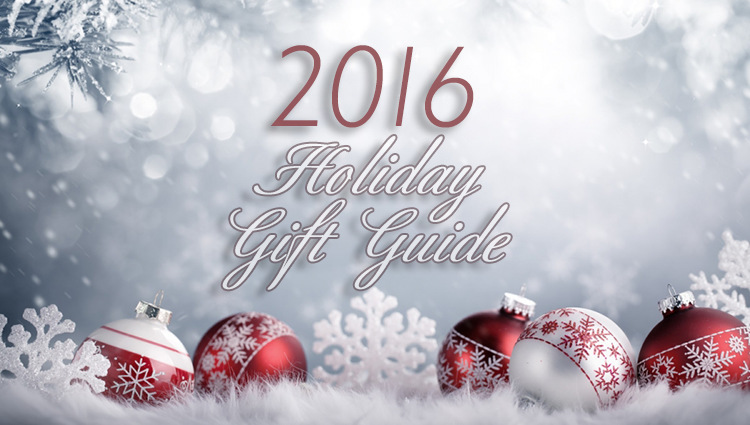 If you haven’t been able to complete your holiday shopping, don’t worry… we still have a few more suggestions yet to come! Don’t forget that as you go through this list, if you see the logo, click on it to be directed to an in-depth review! Your goal: Help Tippy the dog return to his dog house! Young players use deductive reasoning to place Tippy’s chew bones, tennis balls, and food bowls in the correct order to unlock the secret door and send Tippy home. Available exclusively at Target and target.com. .
Katamino is a superb puzzle and a challenging game. Players try to make rectangles of varying size with just 3 pieces up to using all 12 for greater difficulty. With over 350 puzzle suggestions and more than 36,000 combinations, it provides hours of entertainment. The Deluxe edition of the games are made from several different types of solid timber, making a great present for any puzzle enthusiast. Recognized through numerous awards, it is often purchased by school for its educational value: Katamino can also help children understand the basic concepts of geometry and help to develop their observation skills and spatial awareness while enjoying themselves. The UGM-11 Truck is “Rubberpunk,” a perfect blend of clockwork and steampunk worlds; a new generation of UGEARS mechanical models with greater sophistication and more features. This model runs, shifts, steers, and accelerates just like a real truck. ‘Fuel up’ by turning the lever on top of the cab, ‘start’ the engine with the shifter in ‘idle’ and see four pistons moving under the folding hood. Find a fully functioning steering wheel and even working gas pedal. Ready for a ride? Shift the transmission into ‘forward’ or ‘reverse’ and watch your truck head back to the fields for another load of hay. This kit may take some time to build, but the rewards are absolutely worth it. Buy Direct from Ukidz Toys on Amazon! Use your smart phone or tablet to explore the amazing world of microscopes with Smartscope! Search the house and yard for cool things to magnify, including water, sand, feathers, leaves, insects, and more. With a removable light source, sliding object tray and two levels of magnification, you’ll be able to scope out all kinds of objects in minute detail. Then, use your smart phone to take a photo of the object then email or text to your friends or view your finds together on the big screen via TV. It’s a whole new way to “share” your love of science. 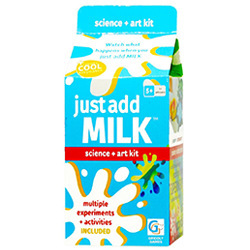 Just Add Milk all new science experiment kit for kids. The fun and easy experiment kit comes with everything you need, except the milk, to explore amazing, safe, chemical reactions that include one-of-a-kind vibrant color displays and cool color burst demonstrations, among other explosive results. Just Add Milk is about the fun of science. It’s an early entry to exploring more in depth interest and curiosity that children will have in science, engineering and technology in their future. Drawing is as easy as Trace-Turn-Draw! 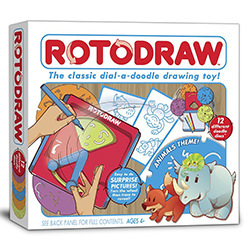 Young artists can easily create adorable characters, animals, faces and more with the classic Rotodraw™ drawing toy! Insert a Rotodraw™ Doodle Disc™ into the drawing tablet, then trace in the lines and turn the crank until your drawing is complete. Set includes design paper, sticker sheets and card sheets for fun character creations. Create a perfect surprise picture every time—just turn the wheel to trace and reveal. A long-lost treasure is waiting to be discovered at the bottom of a sea. Become the brave Ocean raiders and get on with the adventure. 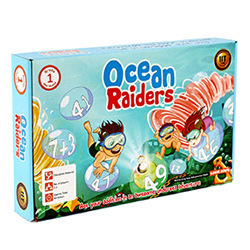 Ocean Raiders is a perfect gift for kids of 6 years and up. Give your kid 11 times more addition practice along with this unique and fun math board game. This game guarantees to not only provide more math practice, but also develops many life skills. The game comes with a unique 10-faced dice to provide comprehensive addition practice along with unlimited fun for families to bond over. Lux The Principle Block is a snap and lock hinge system that allows kids (and parents) to use their imagination by creating structures that curve, bend, flex, twist, turn and move while retaining strength and stability. 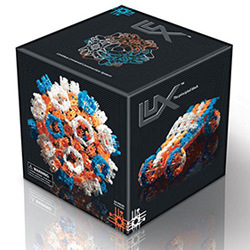 Now builders and innovators of all ages can use Lux Blox to model machines, biological organisms, architecture — or whatever structures they can imagine! The point of Lux is to give people access to nature’s design principles with a fun play experience that encourages creativity and exposure to the patterns and forms found in nature. 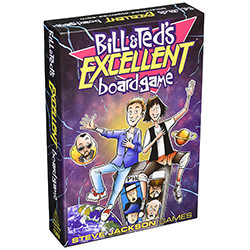 Bill & Ted are back! In this game for 2 to 4 players, collect personages of historical significance to pass your oral history report. Play cards that determine how your time-and-space traveling phone booth moves on the board. But beware! Each time you bag someone, the phone booth breaks most heinously, and movement becomes harder! It’s quick to learn, takes about half an hour, and provides a shot of 1980s nostalgia. Be excellent to each other! Ages 10 and up. Roominate is an award-winning and customizable line of wired building systems that inspire open-ended, hands-on play. 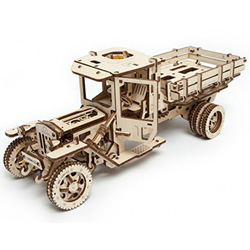 Using circuits, modular building pieces, kids can build and create their own unique and original structures or vehicles that can be joined together or taken apart and remade into something completely new and different. 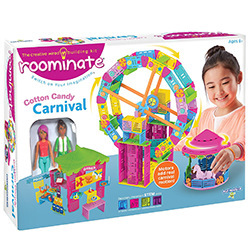 Roominate inspires the next generation to have fun with STEM, and to help develop hands-on problem solving and boost self-confidence, all while turning kids into creative engineers! For ages 8 and up..
An explosively fun card game accurately themed around the chemistry of basic elements, ionic bonding, and everyday compounds! 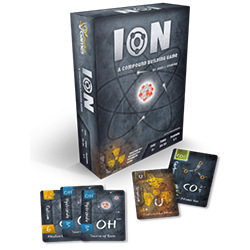 Ion: A Compound Building Game is a quick card-drafting game where players select from ion cards and noble gas cards to form neutrally charged compounds or sets of stable noble gases. Radioactive Expansion cards are included for advanced gameplay! 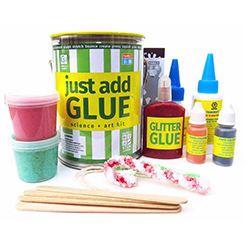 Just Add Glue is the exciting new science activity kit that is sure to stretch the imagination! Use this cool new kit to create different forms of super stretchy polymers and make them bounce in this basic introduction to chemistry and material engineering! By creating gluey gooey putties that can be picked up, stretched, and even rolled into a ball that bounces. Just Add Glue kit experiments let you mix separate batches of varying amounts of two main ingredients to witness the difference that consistencies can make. The product allows an underlying lesson about states of matter including liquids and polymers. Buy Direct from Griddly Games! These fun and creative products will hopefully give you some ideas for putting S.T.E.M. gifts under the tree. They make awesome teacher gifts as well! 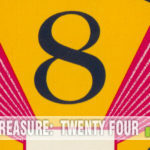 As with our other guides, look for the tiny logo on titles that we’ve previously given a full preview. Be sure to keep an eye out for most of these items to show up in our 100+ Days of Giveaways. These games would all be wonderful for my grandchildren. My grandson would appreciate Katamino, he loves all things math and my granddaughter would like Just Add Milk and Just Add Glue to name a couple. It is awesome that game makers realized how well their products could be used. I love all those science kits you have listed up there–Just add milk and just add glue would be perfect to start kids on a life long love of science. Ion–well–chemistry is where it is at!! 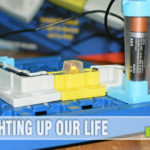 I’ve got three little ones that are mostly too young to really engage with STEM toys and activities but definitely something I love to promote. Thank you for the list. I really like the UGears 3D Models. They are quite cool looking. These are all such great picks. I’ve always loved to get gifts like this for my niece and nephew. STEM is going to be a huge part of their worlds when they enter the workforce. My kids are always doing “science experiments” which means I’m going to be cleaning flour off of the dog or peeling who-knows-what out of the carpet. I’d love them to have more direction! I think I’ll start with Just Add Glue. What a great STEM roundup! As the mom of a 9-year old girl, THIS is a list I’m checking out – thanks! I’m over the top in love with your stem toys/games list. We love playing games with our grandkids. I love getting your thoughts and opinion before trying to decide what will be the biggest hit with the grands. Thanks so much!! So many great suggestions…I’m especially interested in the UGears 3D Models. I have a grandson that would go nuts over them! I can’t decide if my kids would actually do the milk experiments or just drink the milk and substitute water. 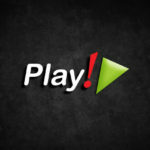 great guide, I love toys and games that help the kiddos learn! I love all of these! 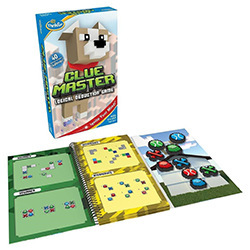 I think my favorite is the Clue Master. Wow! a smartscope sure would be amazing to own! STEM toys are great. I’ve seen ION before and it is on my list for when my kids get old enough to learn from it. LUX and Katamino would be good for spacial awareness. UGears would end up on my desk at work. 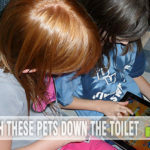 My little ones would spend lots of time with the Smartscope. I remember having a magnifying glass when I was little and looking at literally everything. 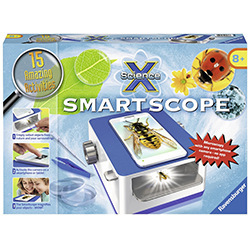 Love the Smartscope my Grandson is 10 years he loves to look at bugs and all kinks of foreign matter. He just looks looking at books with this kind of stuff all the time. So many great things to learn from. My grandchildren hate science and I think the Smartscope would teach them how much fun science really is and they would learn from it too. I love all of these science kits and activities. I ended up purchasing the smartscope from Amazon! I think I could learn something from my 10 year old grandson in helping him build the 3D Truck. I have never put together a Model car or truck of any kind. Besides, I’d have so much enjoyment doing this with him. Would make a great memory for me to leave behind. Thank you & Happy New Year. Smartscope is awesome! I have an obsession with bugs that I have passed on to my children. I would love this for them because they would love to look at the bugs up close! Just so neat!